Home / Opinion / Sports News / Can Barcelona Turn Tonight Around? Can Barcelona Turn Tonight Around? The second leg of the UEFA Champions' league between Barcelona and AC Milan is no doubt one of the biggest games of this season in Europe. A qualification ticket for Barcelona will make the night a night of magic, while for Milan, it will be a dream come through in far away Nou-Camp. It could be recalled that Barcelona suffered a setback in the first tie losing to the Italians by a 2-0 margin putting the team in a difficult position for qualification. Ever since then, the team has also suffered two consecutive losses against their major rival, Real Madrid, in the Spanish League. Today's match will be another test for the Catalonian, especially in the defense line which has been seen by many as their major loophole. The majority of football fans across the world are in doubt of Barcelona’s possibility of strategizing a plan "B" so as to have penetration into the goal area of their opponent this night. The Milan team is understood to have one of the best defenses in Europe. Barça’s job is clear – attack, attack, attack… and defend well! The team needs at least two goals and it’s important to stop Milan scoring at all. Tito Vilanova and Jordi Roura’s team will be sweating on the fitness of Xavi Hernàndez who has been training with the squad over the last few days and should be fit – unlike Marc Bartra who is definitely out. Barça has four players who are just a yellow card away from suspension - Adriano, Song, Mascherano and Pedro. On the other hand, AC Millan will be hoping to maintain a possible draw and an away goal will also be one of their targets in Nou Camp. A comfortable one will of course make the Italian through to the last eight of the Champions' League. They are expected to sit deep and present a well-ordered side, with dangerous counter attacking possibilities – a tactic that certainly worked at San Siro. The Italians come into the game on the back of a great run that has seen them remain unbeaten during 2013. 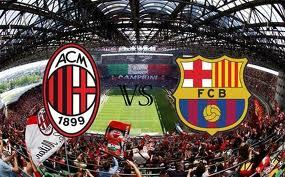 Indeed, none of Milan’s results so far this season would have been enough to give Barça a win in the tie. The cup-tied Balotelli and the injured Pazzini will both be missing, whilst Mexes is doubtful. The game promises to be an interesting one and it will either be to sustain or diminish Barcelona’s status and respect in Europe. A possible plan "B" might be helpful to Barcelona. Who knows, the Blaugrana might again turn things around and make the night a magical one.